This page contains an assortment of useful or informative examples/counterexamples in probability and statistics. I plan to continue updating this page as I come across new examples. The following is an example of what can happen when Bayes factors are used to test point nulls (their only use in psychology). Courtesy of Stone (1997), consider a binomial experiment involving trials with successes, where we want to test the null-hypothesis that . 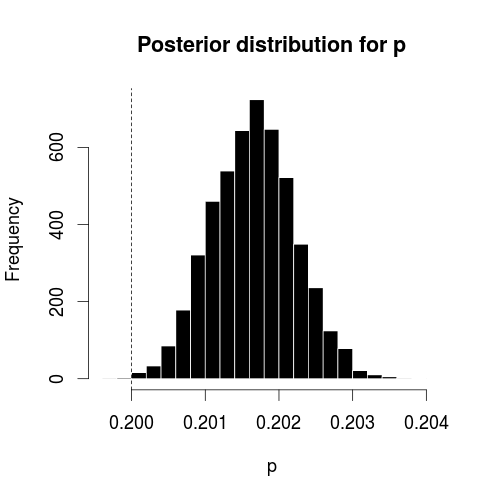 Assuming a uniform prior, the posterior distribution is , yielding a Bayes factor of 8.11, which Jeffreys calls “substantial” evidence for the null hypothesis. But what does the posterior actually look like? This would seem to definitively exclude (in fact, with certainty). A classical hypothesis test likewise rejects with a p-value of . The p-value is the probability of obtaining an effect greater than or equal to the size of the observed effect if the null hypothesis were true. Unfortunately, this is not very well understood in psychology, and p-values are widely misinterpreted as the probability that the null-hypothesis is true (some research suggests that close to 80% of psychology students and researchers hold some variant of this misconception). So we obtain a significant result with , and yet the probability that we have made a type-1 error is 0.99. Confidence intervals, much like p-values, are widely misinterpreted in a Bayesian way. In particular, it is common to interpret a 95% confidence intervals for a parameter as having a 95% chance of containing the true value of that parameter, but this is not true for all kinds of reasons (mostly because parameters are not generally considered to be random variables in frequentist statistics). Construct a confidence interval for the mean of a normally distributed random variable as follows: Take a biased coin (with of returning heads) and flip it. If the coin returns heads, define , otherwise, define (the empty set). If we draw random samples and flip our coin over and over again, then 95% of our confidence intervals will contain the true value (since they contain everything), so this is a 95% confidence interval. What happens if the coin lands on tails? It’s still a 95% confidence interval, but it cannot possibly contain the true value, since it contains nothing! One of the few situations in which the reverse holds is when a set of random variables are jointly normally distributed, in which case they are independent if they are uncorrelated. If is correlated with , and is correlated with , it does not follow that is correlated with . For example, let and be independent (and thus uncorrelated) normal random variables, and define . Then both and are positively correlated with , but the correlation between and is zero.